This morning I had a trip over to Addenbrooke’s Hospital for an MRI (Magnetic Resonance Imaging) Scan of my stump. My appointment was for 09:30 but you had to be there 15 mins before the appointment time. We got to the hospital at about 08:40 which meant we managed to get a disabled parking space without any problems, result. After making our way through the Rabbit warren of corridors we finally arrived at the MRIS department. After booking in I was told to wait for a while in the waiting room. It was pretty quiet in there with only one other couple waiting. I got bored quite quickly this morning and started pushing myself backwards and forwards and then pulling small wheelies. At one point I leant back a bit further but unbeknownst to me Dad had forgotten to twist the stabilisers back on the wheelchair. The point I hit the floor was the point where the realisation kicked in. Dad sprung from his chair, lifted the wheelchair up and turned it round to face me, while I scrapped myself off the floor and climbed back in the chair. Embarrassed was an understatement but thankfully there was no major damage, obviously it has flared my back again but I am sure it will settle down. After the acrobatics I had to change into the customary Hospital gown ready for the scan. The lady went off to get me one of their wheelchairs. I asked her what the difference was between their wheelchair and mine. She told me that theirs was non magnetic and they can get me right up to the machine. If they had used mine it would have stuck to the Scanner, having had all the excitement I could manage in one day I decided to go in their rickety chair. The wheelchair did have brakes on it but they didn’t actually work so they always held it while I transferred. I got in position on the bed where they wedged the stump, placed a mat over the top of my leg and stump and then strapped it down. After being give the much needed set of ear defenders (the machine is ultra noisy) I was all set to go. 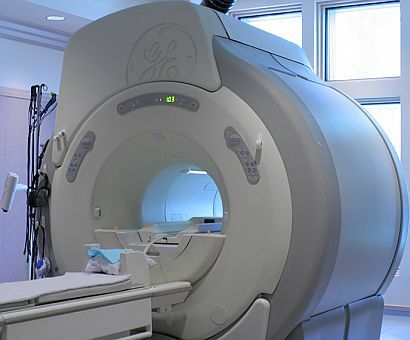 I’ve had an MRI Scan before and thankfully my head was still in the wider part of the machine, I can understand how some people would panic and get claustrophobic having an MRI Scan though. Half way through they stopped and took me out, gave me an injection of dye then put me back in again. The whole process took about half an hour and the dye helps to highlight the blood vessels, this is so they can easily see what is live tissue and what is scar tissue. After all that it was simply a case of getting change and coming home. I have an appointment to see my consultant on the 24th Sept (the earliest I could get to see him) to find out the results and where we go from here, for now its’ just a waiting game.